Delicata Squash is a small, easy to cook squash that’s sweet and tender and doesn’t require peeling because you can eat the skin! Roast it with salt, pepper, and olive oil or cinnamon, brown sugar, and coconut oil for an even sweeter side dish! 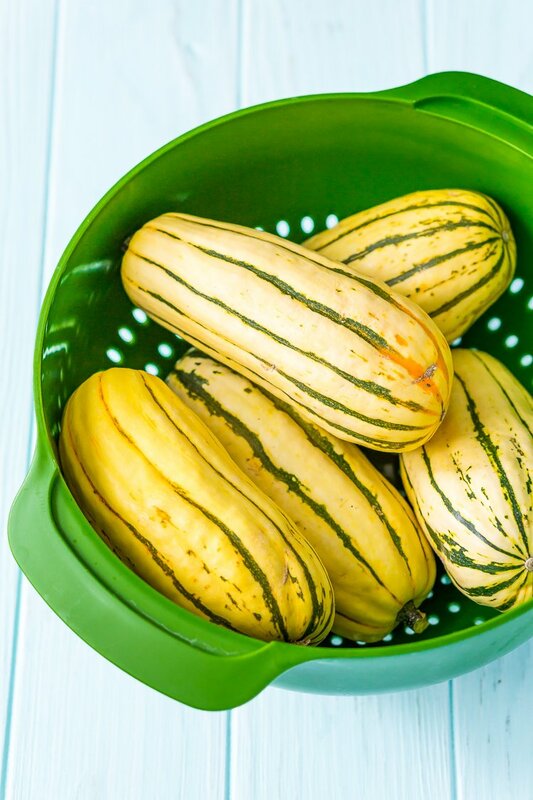 Delicata Squash is one of the most overlooked vegetables out there, but in my opinion, it’s also one of the most delicious! Once you try this delicious squash, you’ll fall in love with the ease of making it and it’s simple sweet flavor! Plus, I’m sharing two ways to make it depending on your tastes! What I love about Delicata Squash is that it’s a small squash, slightly shorter and fatter than a cucumber. JUST TAKE ME TO THE ROASTED DELICATA SQUASH RECIPE ALREADY! 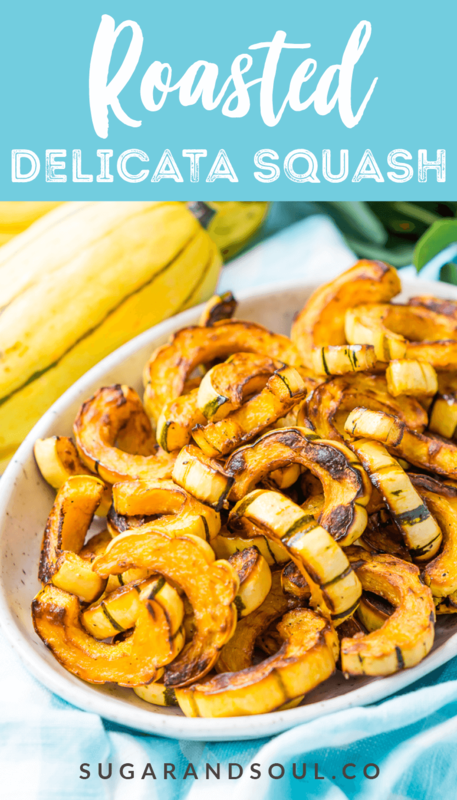 If you’d rather skip my (very helpful, I think) tips and tricks, essential cooking info, and similar recipe ideas – and get straight to this deliciously easy Best Ever ROASTED DELICATA SQUASH Recipe – simply scroll to the bottom of the page where you can find the printable recipe card. Is The Skin Of Delicata Squash Edible? That’s the best part about this squash is that you can eat the skin, so there’s no need for peeling or scooping the flesh out of a piping hot squash, you can simply just enjoy it! What Does Delicata Squash Taste Like? It’s actually been called “sweet potato squash” because of it’s warm and sweet flavor profile. I’m not sure I would say it tastes like sweet potatoes, but it definitely is on the sweeter side with a hint of that cozy winter squash flavor a lot of us love. Roasting a squash has never been easier, and that’s primarily due to the size of this squash which makes it easy to handle and prep. Begin by preheating your oven to 425 degrees F and lining a large baking sheet with parchment paper. Don’t skip the parchment paper as this will prevent the squash from sticking to the pan. While the oven is preheating, begin preparing your squash. 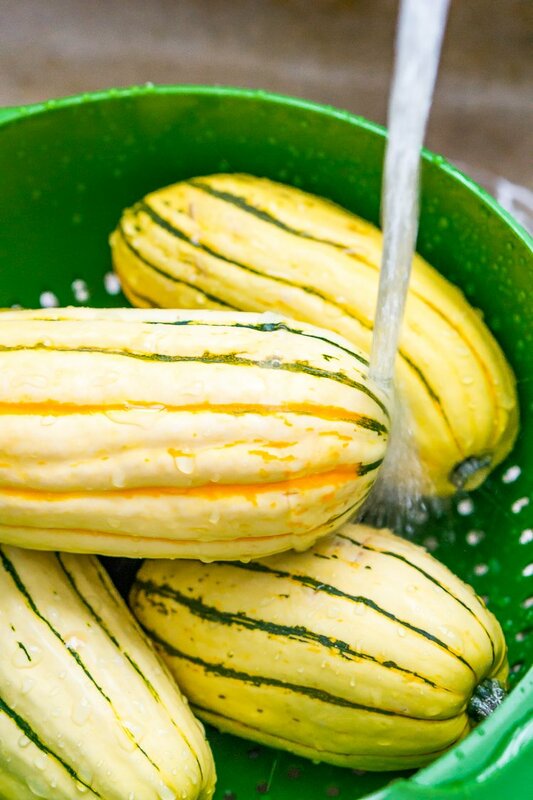 Start by cleaning the skin of the squash well since you will be consuming it. Next, cut off the ends of each of your squash and slice them down the middle lengthwise to reveal the pulp and seeds. Use a large spoon to scrape the seeds out of the squash. 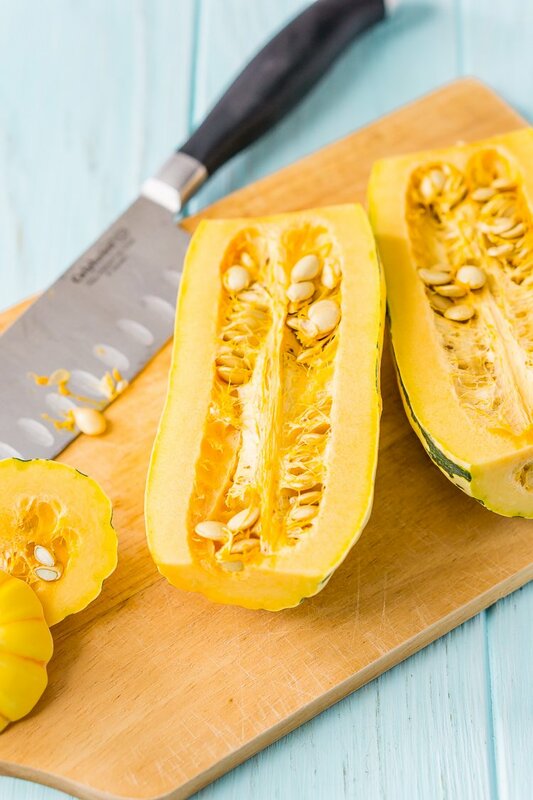 Slice the squash into 1/2-inch thick slices and add to a bowl with your spices and oil and toss to coat. 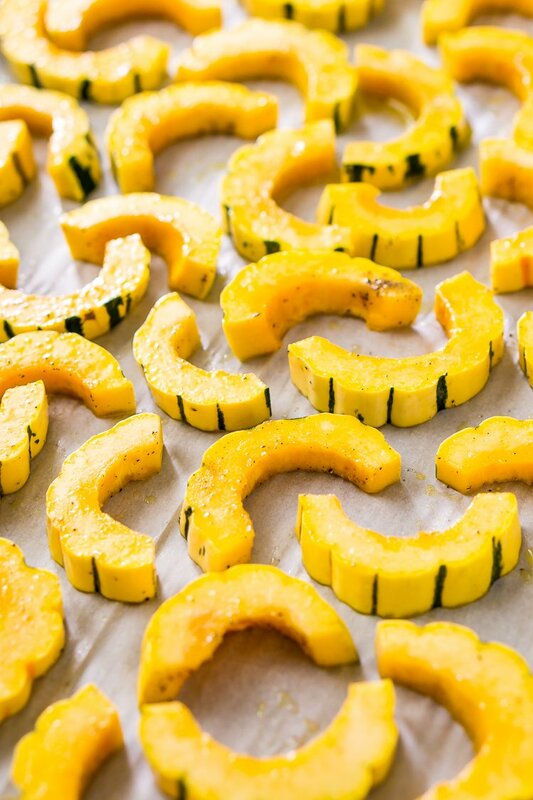 Arrange the squash on the prepared baking sheet and bake for 20 minutes, then remove from the oven and flip the squash and bake for an additional 15 to 20 minutes until the edges are crispy and brown. Enjoy the squash immediately for best taste! Roasted Delicata Squash is such and easy and delicious side dish for winter holidays or even weeknight dinners! It’s sweet flavors and soft texture is sure to be enjoyed by the kids too! 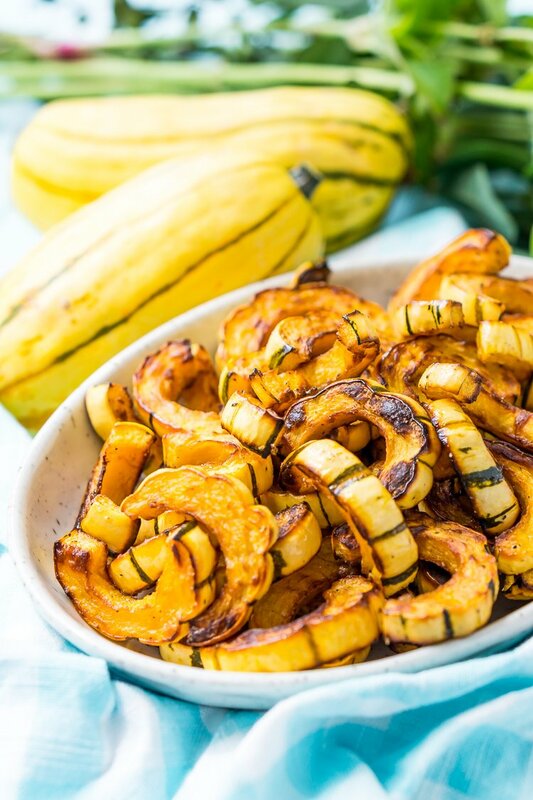 In the recipe card you’ll see that there are two ways to flavor your Roasted Delicata Squash, either the traditional way with salt, pepper, and olive oil or you can take things a little sweeter with cinnamon, brown sugar, and coconut oil (I love it this way for Thanksgiving)! 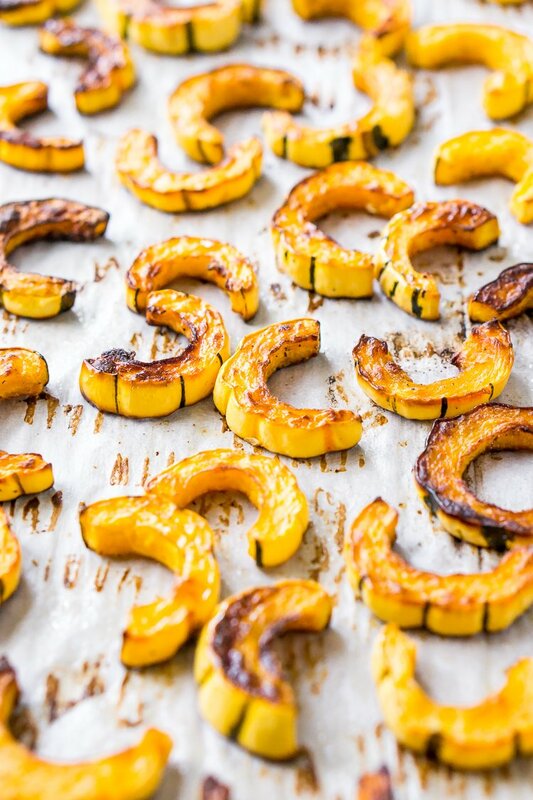 Pin this Roasted Delicata Squash Recipe for Later! Delicata Squash is a small, easy to cook squash that’s sweet and tender and doesn’t require peeling because you can eat the skin! Roast it with salt, pepper, and olive oil or cinnamon and coconut oil for an even sweeter side dish! Preheat the oven to 425 degrees F and line a large baking sheet with parchment paper. Don’t skip the parchment paper as this will prevent the squash from sticking to the pan. Next, cut off the ends of each of your squash and slice them down the middle lengthwise to reveal the pulp and seeds. Use a large spoon to scrape the seeds out of the squash. 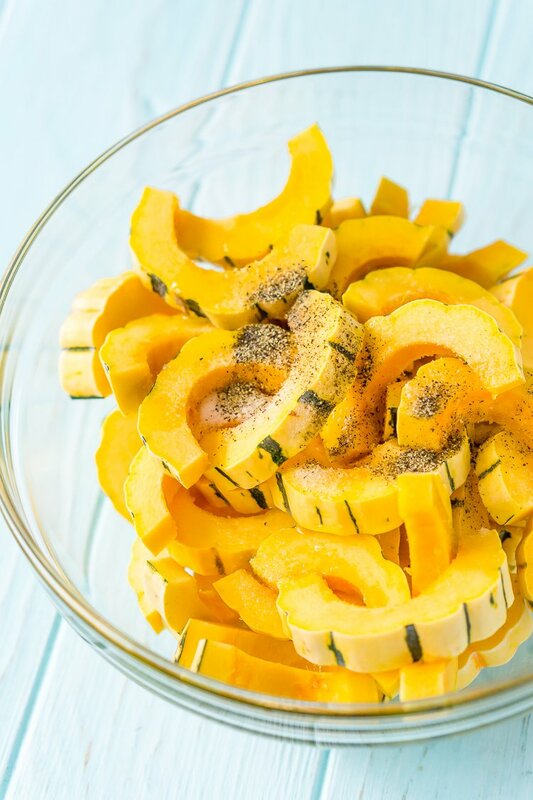 Slice the squash into 1/2-inch thick slices and add to a bowl with your seasonings and oil and toss to coat. 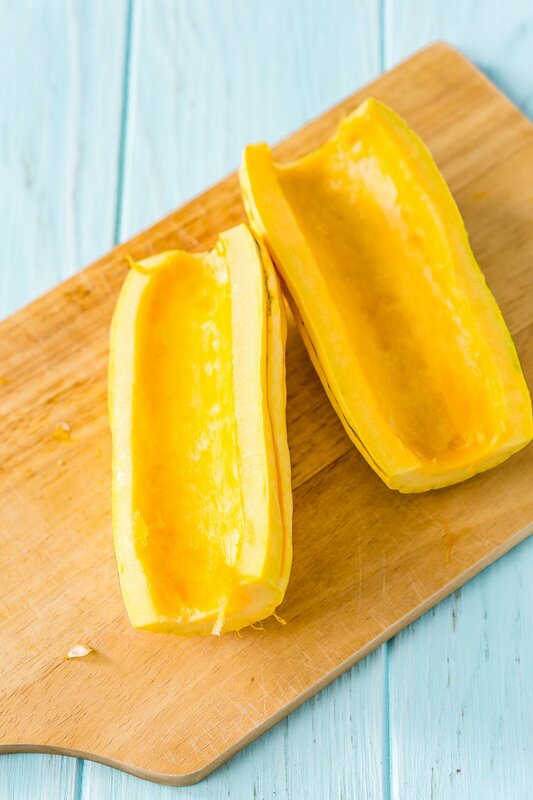 Arrange the squash on the prepared baking sheet and bake for 20 minutes, then remove from the oven and flip the squash and bake for an additional 5 to 10 minutes until the squash is fork tender and golden brown. Enjoy the squash immediately for best taste! Such an easy and delicious recipe to make this fall! My family prefers it sweet but I like the traditional roast. This looks amazing! We just roasted spaghetti squash last night but now I want to try this. I’ve never tried delicata squash before and I like the idea of being able to eat the skin. Thanks for the recipe!